Antipsychotic drugs are effective in the treatment of cannabis-induced psychosis, but only clozapine appears effective in the treatment of comorbid schizophrenia and cannabis use. The unique effects of clozapine on cannabis use could, therefore, be due to an as yet unidentified interaction between clozapine and the endogenous cannabinoid system. To address this hypothesis, we used in situ radioligand binding and quantitative autoradiography with the selective cannabinoid CB1 receptor agonist, (-)-cis-3-[2-hydroxy-4-(1,1-dimethylheptyl)phenyl]-trans-4-(3-hydroxypropyl)cyclohexanol (side chain-2,3,4(N)-3H) ([3H]CP 55940) to measure the density of the CB1 receptor in frontal cortex, hippocampus, nucleus accumbens and striatum from rats treated with a variety of antipsychotic drugs. Clozapine significantly decreased [3H]CP 55940 binding in the nucleus accumbens compared with vehicle after 1 (35.0±14.0 vs. 71.2±8.5 fmol/mg estimated tissue equivalent (ete); P=0.03) and 3 months (42.3±4.0 vs. 71.1±16.3 fmol/mg ete; P<0.04) of treatment, an effect not observed with haloperidol, chlorpromazine or olanzapine. In rats treated with clozapine for 3 months and then left for 1 month without treatment, [3H]CP 55940 binding was not different in the nucleus accumbens (100.5±22.2 vs. 100.9±25.4 fmol/mg ete; P>0.10). By contrast, there were significant increases in accumbal [3H]CP 55940 binding in rats treated with haloperidol (136.5±14.2 fmol/mg ete; P<0.05), chlorpromazine (137.4±12.7 fmol/mg ete; P<0.05) and olanzapine (144.7±10.1 fmol/mg ete; P<0.01). 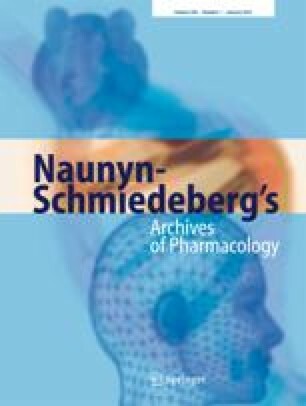 These data indicate that in the nucleus accumbens clozapine differs from other antipsychotic drugs in its effects on [3H]CP 55940 binding. If these results can be extrapolated into humans, then this effect of clozapine on the CB1 receptor may be a mechanism that makes it uniquely effective in schizophrenia and comorbid cannabis use. S.S. was the Lilly Psychiatry Research Fellow of the Royal Australian and New Zealand College of Psychiatrists and the Woods Family Trust Fellow of The Mental Health Research Institute of Victoria. B.D. is a recipient of a Young Investigators award from the National Alliance for Research in Schizophrenia and Affective Disorders. The authors gratefully acknowledge the assistance of Elizabeth Scarr, Geoffrey Pavey, Robyn Bradbury, Tabasum Hussain, Lee Naylor and Fiona-Marie Parkin.